The data in professor Sanjay Kumar Singh’s article, “Future Mobility in India,” predicts India’s CO2 emissions to increase to 93.25 million metric tons in 2020. That will be 73.45 more metric tons than the 2001 CO2 levels. In the era of climate-change speak, auto image-based cities like Los Angeles and Detroit are trying to reduce their CO2 emissions through better mass transit options like railways and Bus Rapid Transit (BRT). Meanwhile, in India—a country with a well-laid rail network—city and regional governments are investing heavily in road expansion. Singh predicts that by 2020, 91.7% of all India’s traffic volume will be from roads. 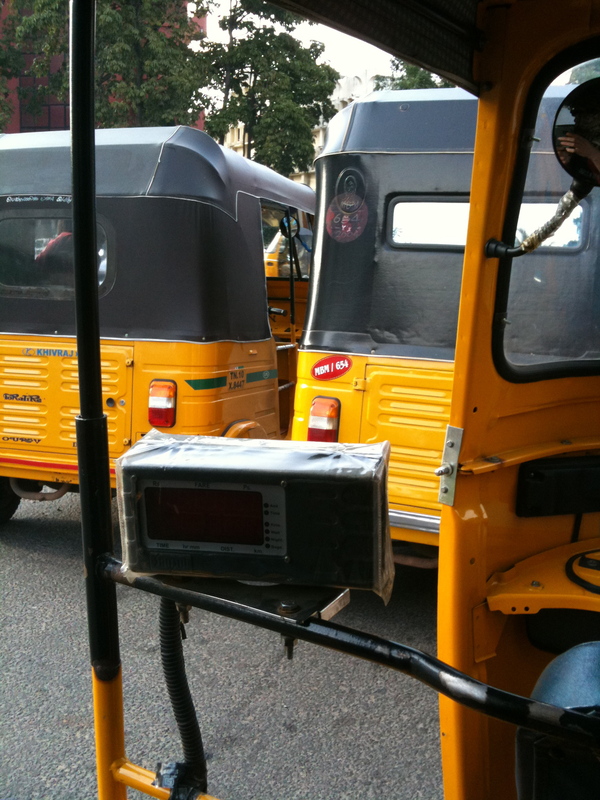 In Chennai, auto rickshaws, or three wheelers, contribute the most sound and air pollution to streetscape. Bikes (motor) come in at a close second. Because both forms of transit are low to the ground, pedestrians of all kinds are particularly subject to the exhaust fumes of these vehicles. Both modes of transport have two-stroke engines, engines that burn oil—diesel—in the combustion chamber. These engines exude more hydrocarbons, carbon monoxide, and airborne particulate matter—which, in Chennai, is more than seven times the prescribed limits of the World Health Organization. However, the reality of the Chennai streetscape, (which may or may not be read as a microcosm for the issue of climate change within the context of the developing/developed world), is that two-stroke auto rickshaws and motorbikes are more green than any car on the Chennai road, and infinitely more sustainable than any hybrid you will find in on the I-75 American interstate. This is due to the sheer number of humans each auto rickshaw and bike transports. 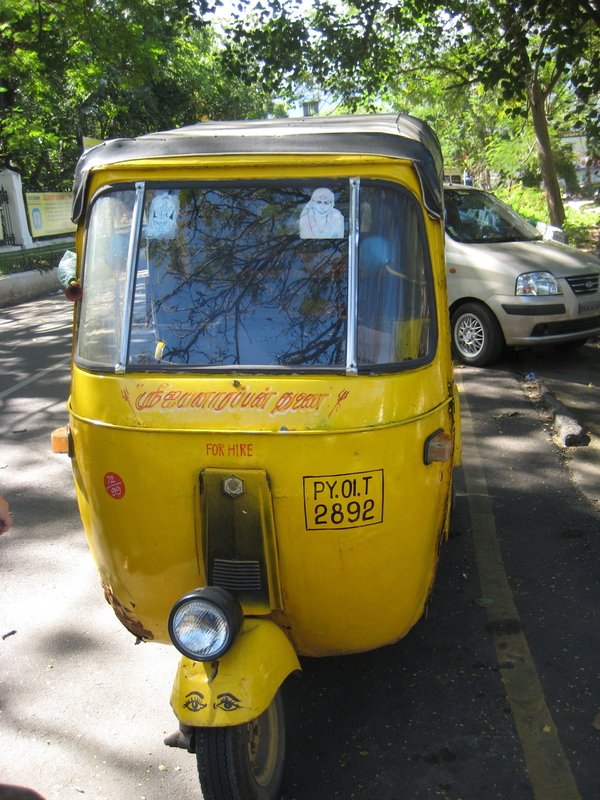 At first glance, the brightly painted auto rickshaws that overcrowd the roads may be described as cute, much like the Volkswagen Bug. 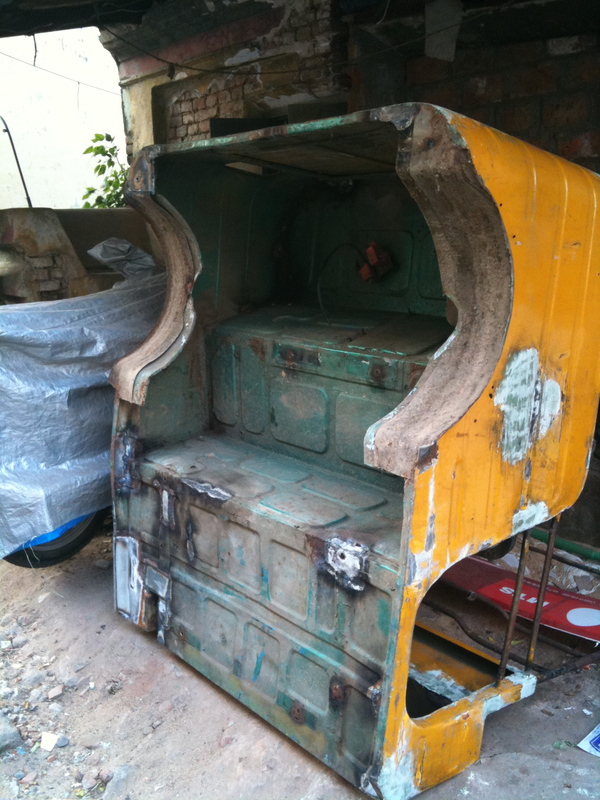 The auto rickshaw has a small, curved cabin resembling something between a 19th century horse-drawn coach and an insect-like bumper car. 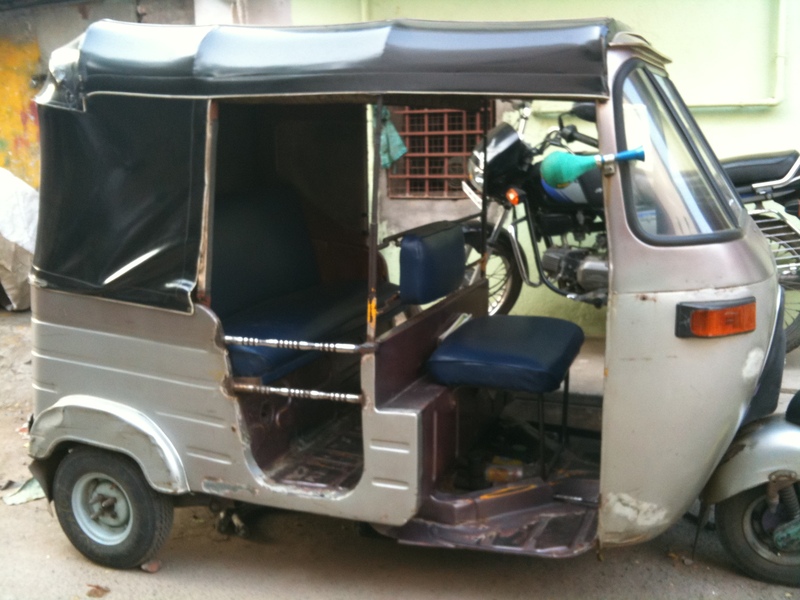 The auto has front and back windshields and two benches inside, one for the driver and a slightly larger one in back, with a little ledge behind the bench for personal belongings. There are no doors; air passes through either side of the vehicle. One may pull down small canvas flaps in the event of inclement weather. Autos operate not by a steering wheel but by handlebars; the dashboard is usually reserved for radios, city maps, and small iconic deities. They are designed to hold the driver and two passengers, though most can comfortably accommodate three. However, in Chennai and particularly in more rural areas, it is more common to see four or five and up to six or seven people. The same holds true of motorbikes, where almost every bike has two passengers, but three or four is not uncommon. Even the traditional bicycle provides innovative solutions for transporting more than one person. Ironically, in Chennai, the car—a most spacious entity—is typically occupied by one person. In America, this is considered the norm, which is why cities like Los Angeles offer road incentives for those who carpool. A carpool—which is defined as vehicle with more than one person—is granted the privilege of a separate, less congested lane. In Chennai, less congestion has a price. The IT corridor, which connects major parts of the city, is a toll road and thus better maintained, faster, and full of single-person automotive vehicles. As the automotive capital of India, Chennai’s car ownership is likely to increase, thus helping fulfill Singh’s 2020 traffic prophecy. Despite the dismal reality of a new six-lane extension project for Old Mahabalipuram Road, there are some suggestions that the Indian government is recognizing and giving incentive to the unique transportation options of the county. The Automotive Research Association of India has been looking at electrical, battery, and solar-powered vehicle options for over 5 years now. Meanwhile, organizations like the Institute for Transportation and Development Policy are pushing for the New Delhi government to remove the ban on cycle rickshaws, and create a separate lane for these vehicles. Perhaps the largest threat to India’s transportation crises is the lingering status symbol of the car and the ability of international companies (not only automotive) to market them as objects of class, mobility, and thus freedom. As journalist and automotive expert Murad Ali Baig suggests, India’s post-economic liberalization is no longer an atmosphere of Gandhian simplicity and humbleness; being able to cruise down the IT corridor in a comfortable, air conditioned car at 6pm on Monday evening is what most Chennaites dream of—myself included. So while pollution and traffic is high, what we see at present may be more environmentally friendly than our future transportation patterns. Kiencke, U. and L. Nielsen. 2000. Automotive Control Systems for Engine, Driveline and Vehicle. Berlin: Springer. McCormick, R., Ross, J., Graboski, M. 1997. “Effect of Several Oxygenates on Regulated Emissions from Heavy-Duty Diesel Engines.” Environmental Science and Technology. Vol. 31, No. 4. Singh, S. 2006. “Future Mobility in India, Implications for Energy Demand and CO2 Emission.” Transportation Policy. Volume 13, Issue 5.